In my opinion, the best plants are the ones where you stick them in the ground once and they come back year after year providing you with a free and mostly effortless harvest. Blackberries are an excellent plant that can fill that role for you. If you have a larger homestead, make a space for a berry patch! 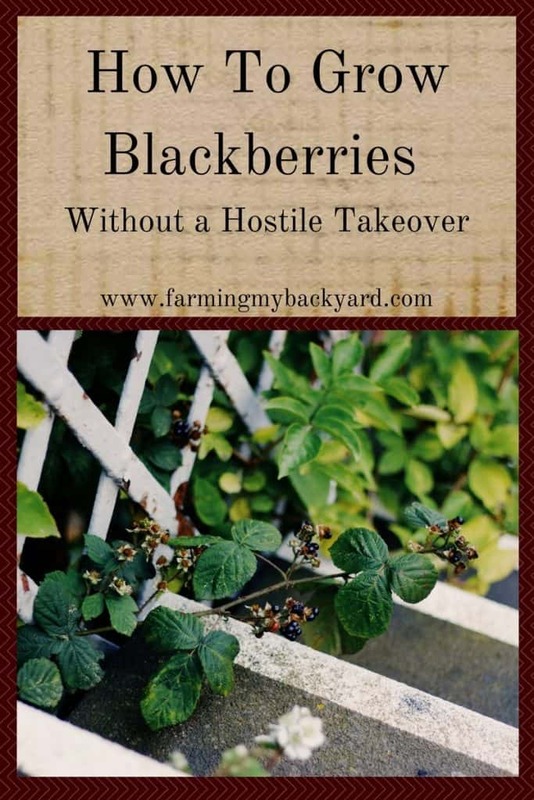 However, if you have a smaller homestead, you may be wondering how to grow blackberries without it turning into a hostile takeover of your entire property. The first consideration when deciding to grow blackberries is to pick what type. In my case, that was already decided for me. When we moved into our house, a significantly sized portion of the yard was dedicated to guarding Sleeping Beauty’s castle. The berries were wild, but productive, so they got to stay. Mostly. Growing blackberries usually requires a trellis, but there are self supporting varieties out there. Those may be a good choice for a small homestead. There are also thornless varieties! A thornless blackberry could easily be slid into corners of a typical yard, without having to worry about getting your arms ripped to shreds if you accidentally walk too close. Or perhaps you have the opportunity to get free blackberry canes. Free is awesome! The type of blackberry is less important than how you maintain it. If your main goal is awesome berries, make sure you pick a sunny location to grow blackberry plants. Blackberry vines will grow just fine in the shade, but they won’t produce fruit. If you want a privacy barrier on a large property line that might work just fine for you. For me, it’s all about the harvest. If you have a trailing variety, make sure to get your support system in place before planting. I like planting blackberries along fences, but you can also use a trellis and put your berry patch anywhere! Decent drainage can help too, as can access to water if you live in a hot area and need to help them out occasionally. Watering weekly can help improve the quality of the fruit. Blackberries root shallowly, so there’s no need to dig a big hole. Space each plant several feet apart. They will take care of filling themselves in if you so desire. Get them off to a good start with a hearty drink of water. Once your blackberries are in the ground, keep them well mulched. This conserves water, gives them additional nutrition, and keeps down weeds. When the berries turn very dark purple, or black, it’s time to harvest them! They should pop right off the bush when you pick them. If not, try again in a day or two. Blackberries are delicious fresh. They also make great jams, sauces, baked goods, AND they can be frozen for later! To freeze blackberries, lay them out on a cookie sheet and freeze until they are solid. Then move them into a plastic bag for long term storage. I think blackberries make excellent additions to green smoothies. Related Posts: A Green Smoothie Is The Perfect Way To Hide Vegetables and Just How Easy Is It To Make Raspberry Jam? The real trick to how to grow blackberries without being overrun by them is in the pruning. Blackberries reproduce in several ways. They can grow from seeds dropped by birds or fallen fruit. Blackberry plants send out new suckers from their roots that can pop up anywhere. They also can root themselves if the tip of the canes fall over and touch the ground. In the spring, you should tip prune your blackberries. When growing blackberries this helps them put more energy into producing berries and will help you get a larger harvest. It also keeps very long canes from drooping onto the ground and spreading themselves where you don’t want them. Blackberries produce fruit on the second year canes. That means that you will want to grow new first year canes for next years harvest. After your have harvested this year’s crop, those canes will not fruit again. Chop them down to the ground! When growing blackberries you have to be ruthless. When new shoots pop up where you don’t want them, feel no remorse about mowing, pulling, or chopping them back. Don’t let things get too out of hand! However, if you do, a good pair of gloves is an absolute necessity when pruning. If you do get blackberries growing where you don’t want them, the best way to get rid of them is to dig up the root ball. If you just run a rototiller over it, all those little pieces of root will come back as new plants. Herbicides do work, but they aren’t that great for your garden or for the bees. Digging up root balls takes a little bit of time, but as long as you are consistent, you can prevail! If digging isn’t your thing, repeatedly cutting back new growth will also eventually exhaust the plant, or you can cover that area with thick black plastic. It isn’t difficult to learn how to grow blackberries, and they can provide an excellent crop year after year with only a bit of maintenance. Don’t be afraid to include blackberries on your urban homestead! We planted our first blackberry bush this year and this post was so beyond helpful for us! Thanks! Yay! I’m glad it was useful.